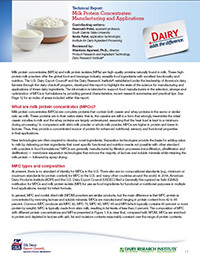 Milk protein concentrates (MPCs) and milk protein isolates (MPIs) are high-quality proteins naturally found in milk. These high-protein milk powders offer the global food and beverage industry versatile food ingredients with excellent functionality and nutrition. This report highlights the state of the science for manufacturing and applications of these dairy ingredients. Also available in Chinese (Simplified) | Korean.